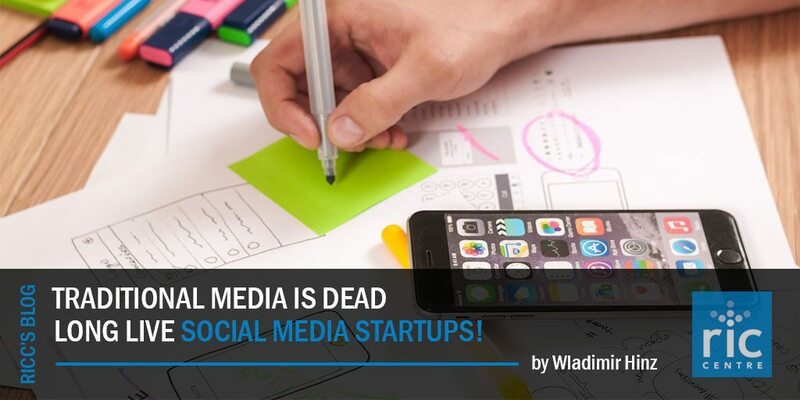 Traditional Media is Dead; Long Live Social Media Startups! Much has been written about the imminent demise of traditional media – newspaper, TV, and radio. It’s true they’re suffering, but they aren’t dead yet… Unless you’re in the startup business, where investing in digital media, especially social media, is the present trend. Traditional media is dead. Well, not yet, but eventually. The rise of social media has marked the beginning of the end of traditional media. From print to television, the immediate availability of information on the internet and social media has revamped the way people connect (or get their daily dose of news and entertainment). Traditional media won’t die in the typical sense though, as mobile and social media are emerging, it will most likely merge with new technologies, revamping the way it connects with consumers. It will surely evolve to a more consumer-behaviour-based technology that prioritizes customer control and user customization. The rise of the global social media market has been mainly boosted by the rising number of users in mainstream social networks, the increasing penetration of mobile technology, and vast advertising spending. By the end of 2015, social media users will have grown to more than 2 billion, which means that 1/3 of the world’s population will be present in at least one social network. It’s projected that by 2020, social networks will be almost at the 3 billion mark. Unique mobile users are around the billions too, 3.649 billion for 2015, which represents a 51% market penetration. But advertising, this is what’s leading the trends. For 2015, spending on social media advertising is expected to reach a whopping $23.7 billion. This type of marketing has been growing relentlessly and it doesn’t look like it’s going to stop anytime soon. The natural result? Startups sprouting all over the social media market place, especially along the marketing axis, where 1/4 of the social media startups are concentrated. With plenty of different ‘niche’ opportunities for startups, targetable marketing is improving the way companies aim their sales strategies – and it’s proving to be very effective. This is very important, as sales through social media are gaining a lot of traction. Right now, the amount of solutions available for retailers and advertisers, like social metrics and tailor made analytics, are almost limitless. These solutions weren’t available before – through traditional media – and are vital for the future. Startups like Chute, Attentive.ly, and trueAnthem tap into customer information to gain very precise insights about their behavior. The “merging” aspect of traditional and digital media, is evident when it comes to audio and video content. Traditional formats are taken to the digital environment letting users choose what/when/how to hear and watch. We are just at the beginning though. Advertisers are relying more and more on integrated marketing campaigns between both traditional and digital media to get their message across, and from the sheer amount of spending alone, it appears this combination is yielding profitable results. By 2018, video content will account for over 2/3 of mobile usage, which is why companies and organizations are investing so much into videos this year, especially in analytics, like Tuburlar, and why Facebook is looking to become the next YouTube. There’s a large number of startups related to this out there, like mobli, mubi and Telly. In changing the traditional media of radio, there has been progress too. Podcasts used to be a very obscure way to broadcast information, directed only towards small niches. But that time is over and it’s safe to say that Podcasts are now mainstream. Startups like Speaker or Vadio offer new radio platforms focused on letting audiences decide what/how/where to listen. It’s been a slow growth, but since 2008 the number of listeners in the U.S. has nearly doubled, growing from 9% to 17%. As more consumers enter the social media market, traditional media (the old traditional media we are familiar with) slowly disappears. It continuously fails to engage consumers in the same way, although it still provides a significant amount of information. Traditional media is a great tool for connecting to large audiences of people, it just needs to become more of a social community that allows for a deeper level of relationship. It needs to merge and evolve with social media!